If you've read any of my Fitbitches posts during 2017 you'll notice a theme - it's all about the struggle; the struggle with my mental attitude... not being as good as I could/should be and over-thinking the whole situation instead of just getting on with it. 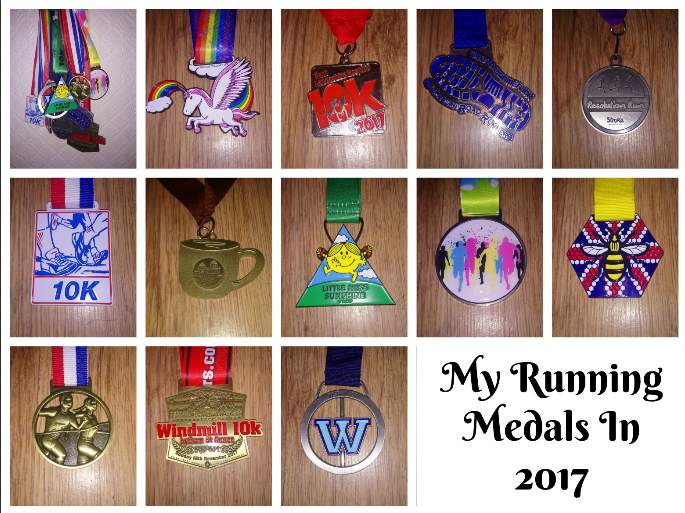 I did have two goals for 2017 - "a medal a month" and "1000km in 2017". I know for sure that I didn't achieve the second goal as my Strava profile shows 657.5km covered for the full year but as I evaluate my activity, I know that with some effort and determination I can actually cover 1000km in 2018. However, you'll see by the picture, I did achieve twelve medal however it wasn't exactly one a month. So rather than mull over the negative, I did think it would be a positive exercise to reflect on my achievements, namely in the medals that I received for completing challenge and races, and share some thoughts about each one. The Unicorn Medal was achieved in January and is a Virtual Runner challenge to get moving at the beginning of the year. It also spawned the #FitbitchesMOVEment idea which I now know has a lot of potential but looks set to change and grow in 2018. The East Lancs Hospice 10k (also in January) was my first attempt at this course - I'd marshalled the year before as I was injured - and it's a tough one. It was super-muddy in places and has one hell of a hill in the middle but fellow runners were half way up that hill shouting encouragement and dishing out hugs and jelly babies. I also had the support of my friend, Susan, at my side all the way and she made sure I got to the end. In February, the Blackburn Road Runners Winter Warmer 10k course is met with a mixture of dread and excitement by most participants. The first three kilometres is uphill and includes my nemesis incline, Buncer Lane. I ran most of it on my own but was very grateful for all the familiar faces around the course shouting encouragement. When I finished I felt a massive sense of achievement as I crossed the finish line. I think there were fifteen fellow runners from my running groups taking part in the Stroke Association Resolution Run (some did the 5k, some did the 10K) in Manchester in March and we painted Heaton Park purple with our stripy socks and fancy dress. This was more of a "fun run" and it was probably the wettest run I've ever participated in but it was good to support a charity that was also the focus of fundraising at our local running club. I'd been volunteering with GroupRun Blackburn Progression Group and this medal was for the March 10k Celebration Run. It was a horrible run for me with a mini panic attack at 9k and the need to give myself a good talking to. Looking back, I can see that this is where my confidence really diminished but having this knowledge means that I can know what to look out for in the future if I'm feeling a bit unsure about my running. The Coffee Cup was another Virtual Runner challenge - to run/walk 5k - and I used this medal to encourage a few friends to start their #FitbitchesMOVEment journey. As we all live in separate parts of the country, we all agreed to train for and then run/walk 5k on the same date in March. Watching my friends become active, have a reason to move more and have a goal to attain by a certain date filled me with pride. Most of the participants have carried on their fitness journey with one now training for the 2018 London Marathon. Little Miss Sunshine was another 10k challenge from Virtual Runner (I promise I'm not sponsored by them haha) but the charity for this run was Children With Cancer - obviously something that I want to support as my daughter is a Neruoblastoma survivor. The May Fun Run was yet another virtual run. I think I logged 7k for this one and, shamefully, I can't remember why or even the charity behind it - but, hey, we do it for the bling, don't we? Plus, at this time of the year, I was still more or less on track for the 'medal a month'. How can any of us ever forget the Manchester Arena bombing on 22nd May 2017? A whole wave of fund-raising events sprung up to raise money for the victims and their families including this #Run22 medal where you had to run for just 22 minutes (although some people ran for 22 kilometres or 22 miles). The medal was commissioned especially and the ribbon displays the words "Forever Manchester - Always Remember". After falling out of love with running earlier in the year, I went back to volunteering for the 'couch to 5k' plan with GroupRun Blackburn. In the September edition of Fitbitches I wrote more about how this is my comfort zone and where I know that I can reconnect with my reason for running. I participated in the August Celebration Run and received the same medal that we award all our new runners. It was like returning to the beginning again and a new start for me. And if you're a regular reader, you'll know that I joined Blackburn Road Runners in November. November brought a new challenge - running one of my favourite races as an official club member. The Fylde Coast Runners Windmill 10k was the first ever "long" run I ever completed back in 2015 and it's on my home ground. I hadn't run this distance in a few months but, yet again, fellow runners - Bev and Amanda - ran with me and pulled me through to the finish line. The final medal of the year was the Wesham 10k, organised by Wesham Road Runners and always well attended by the Blackburn crew because many of us run to support and raise money for Theo's Warriors - a local cancer charity. Another good course and another run where I was propped up for most of the way, this time by Lesley. There haven't been many 'personal best' times recorded this year and it's been rocky twelve months were I haven't really known what my focus was. Looking back, I now realise how much support and encouragement there is out there for me and I'll be eternally grateful for that. It's made me look at my progress differently and I now accept that a few changes have to be made and that having a challenge to work towards really helps with my vision. I 'acquired' another "Winter Warmer" place for the 4th February (don't ask!) and I've book the Sweatshop 10 mile (YES, MILES) in Blackpool for the 18th March so they are my first challenges of the year. I'm going in with a Positive Mental Attitude, a professional arse-kicking training partner (yo, Claire!) and I'll be wearing my Blackburn Road Runners vest with pride at all events.